What Are the Health Benefits of Pure Lemon Extract? What Are the Benefits of Lemon Drops? Can You Whiten Teeth With Orange Peels? What Are the Health Benefits of Lemon Grass? Patients who suffer from dry mouth may benefit from using lemon glycerin swabs. However, they are not recommended for use over a long period of time. Lemon glycerin swabs have long been used in the medical field, but many medical professionals argue their effectiveness and potential harmfulness to the patient. John R. Ashford, Ph.D., CCC-SP said, "the glycerin swabs alone appear to moisten the mouth and do not clean it, but the lemon additive may, in fact, act to dry out the mucosa of the mouth-the opposite of what is desired." Lemon glycerin swabs work in relieving dry mouth in patients. 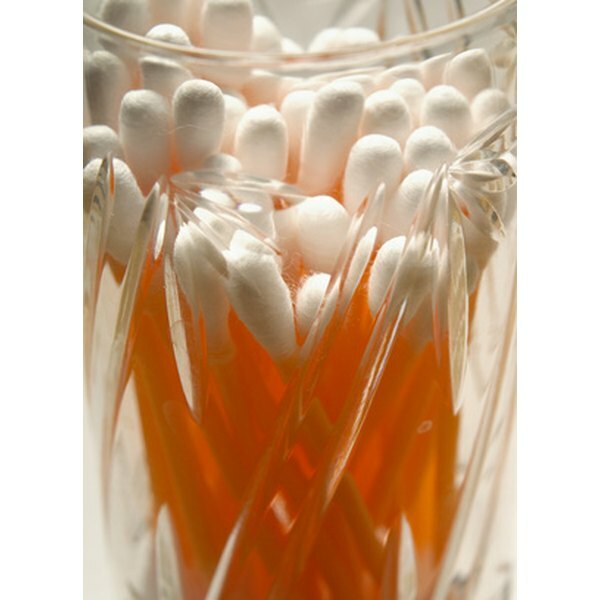 The glycerin in the swabs is what stimulates the production of saliva. Glycerin is found in many household items and is believed to draw the moisture to the surface of the skin or in this case, the mouth. In addition to the glycerin, the lemon flavoring in the swab stimulates the taste buds to help in the production of saliva. The lemon flavoring is believed to be one of the causes of the drying to become worse with the use of the swabs. Patients who benefit from the use of lemon glycerin swabs include those suffering from dysphagia, who are on oxygen, on a ventilator, under anesthesia, recovering from surgery, taking chemotherapy or those who have other drug induced dry mouth. Although the patients may benefit from the use of the lemon glycerin swabs, they are not recommended for long term use. According to the American Dental Hygienists' Association, the use of lemon glycerin swabs could result in decalcification of the patient's teeth. Lemon glycerin swabs can be used as a temporary alternative for oral hygiene, but their use is discouraged by many health professionals. Lemon glycerin swabs are commonly used in hospitals as an alternative to a tooth brush. The swabs are used to remove secretions from the patients mouth, this is believed to help stop the growth of harmful bacteria. However, according to the American Dental Hygienists' Association, lemon glycerin swabs are not effective in removing plaque from the patient's mouth. Plaque that is not removed from a patient's teeth can eventually come loose and travel to the patient's lungs. Once used in almost every health care setting, lemon glycerin swabs are no long used as much due to the potentially harmful effects they can have on patients. As more information becomes available about the harmful effects of lemon glycerin swabs, more health care settings are deciding to stop the use of lemon glycerin swabs. Cristy Broughton started writing professionally in 2011 for various websites. She graduated from the University of South Carolina at Lancaster with an associate degree in art and also attended York Technical College in Rock Hill, S.C., obtaining a Medical Office Assisting Certificate. What Kind of Solution Do I Put in a Waterpik?